When I first sprited Joe Musashi from scratch in 2012, it was in his original uniform from the Shinobi arcade game and I tried (and failed) to make his face look a bit like Sonny Chiba, the actor whose face inspired the title screen for the game's sequel (or, technically, offshoot) the Revenge of Shinobi (a.k.a. the Super Shinobi). The results don't look as Chiba-like as I'd hoped, but it keeps him from looking generic. I finally sprited him in his Revenge of Shinobi look in 2014 (celebrating that specific game's 25th anniversary) to replace the old sprite edits I'd made long ago for the ScrollBoss site. 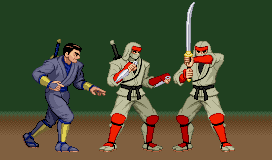 Nakohara (the final boss from the Revenge of Shinobi) and the low-level ninja from Revenge of Shinobi were made at the same time as the Shinobi 1 Joe sprite. The Bat-doppelganger sprite, based on a Revenge of Shinobi boss that was later removed from the game for reasons you can probably guess, was sprited in 2014 when comic fandom decided that celebrating Batman's 75th once just wasn't enough, as if Batman doesn't get enough attention.